Japan's largest art fair commences next week from April 2-5 and for the first time my gallery will be exhibiting. The event is at one of Tokyo's most outstanding buildings--The International Forum--right in front of Yurakucho station. My good friend Steve Beimel recently wrote about it and that can be read here, scroll down: http://www.japanlivingarts.com/ The Art Fair, Tokyo's homepage can be viewed here: http://www.artfairtokyo.com/en/index.html If you happen to find yourself in Tokyo please do stop by! 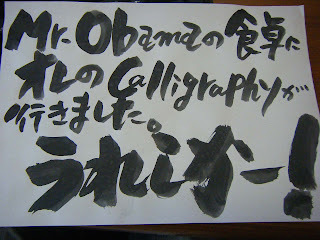 In Fukui prefecture--home of Echizen pottery and Kumano Kuroemon--there is a small town called Obama (small seashore). As can be expected when Barack Obama was elected president the town went wild and now features all kinds of 'Obama goods' such as rice crackers and bean cakes with the prez's face beaming. The town's mayor is doing all he can do get President Obama to visit and this includes sending all kinds of gifts. The other day I received news of such a gift from the 'bear of Echizen' ceramic artist Kumano Kuroemon. Kumano also is known for his bold calligraphy and was asked to write the kanji for chopsticks--hashi--to be included with a hashi set sent to the White House dining room. 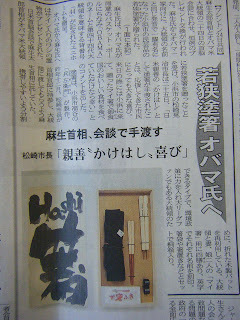 Such a 'major' event for the local town made the regional newspaper and I attach photos of both Kumano's calligraphy and the article. I wonder how Obama's hashi skills are; in Japan--no matter how long one has been here--folks will always compliment you if your hashi technique is good enough to pick up beans!